Secure Hash Algorithm (SHA) algorithms are widely used in most cryptographic systems and remain an important component in most modern authentication protocols. These devices support the SHA-256 standard. The ATSHA204A is the most cost-effective solution in the Microchip CryptoAuthentication portfolio. It integrates the SHA-256 hash algorithm with a 4.5Kb EEPROM and provides robust hardware authentication using secure key/data storage. The tiny packaging and a single-wire interface make the device ideal for handheld electronic systems and any space-constrained embedded system. CryptoAuthentication devices in the SHA mode include client and host security capabilities that offload key storage and algorithm execution from the microcontroller, significantly reducing system cost and complexity. SHA based symmetric authentication is fast relative to asymmetric approaches, making the ATSHA204A a good choice with speed (and/or cost) are important considerations. CryptoAuthentication devices have full metal shields over all of the internal circuitry, so that if an attacker cuts or short circuits any trace in the shield, the product stops functioning. Additional security features include internal clocks and voltage generation, encrypted memories, tamper detection, and fully secure production test methodologies. With the ATSHA204A implementing host-side security to provide a full system solution is now easier than ever. 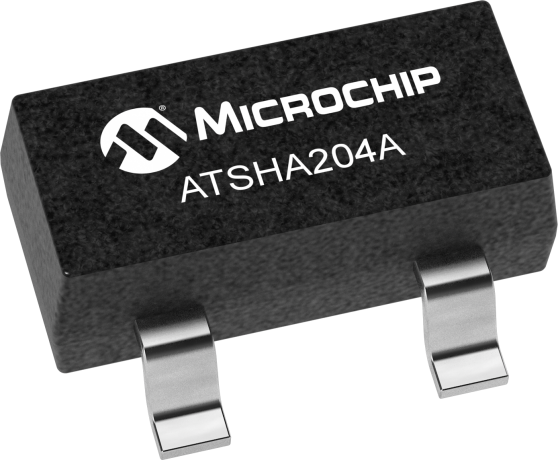 The Microchip's ATSHA204A is a full turnkey security device. It includes a 4.5Kb EEPROM divided into 16 slots. This array can be used for storage of keys, miscellaneous read/write, read-only, password or secret data, and consumption tracking. Access to the various sections of memory can be restricted in a variety of ways and then the configuration locked to prevent changes. Access to the chip is through a standard I2C interface at speeds up to 1Mb/sec. The chip also supports a single-wire interface that can reduce the number of GPIOs required on the system processor and/or reduce the number of pins on connectors. It is compatible with most UART or serial I/O controllers. System integration is eased with a wide supply voltage range and an ultra-low sleep current of less than 100nA.